Ghana Place Names started as a retirement project to combine two long-standing interests, Ghana and toponymy. The former derives from a twelve-year period of employment with the Ghana Teaching Service at the beginning of my career in 1969, and the latter from an interest in language and meanings. Originally I had high ambitions of writing a book along the lines of the excellent work by Charles Whynne-Hammond, but this was soon abandoned, or least postponed indefinitely. Being a physicist by training I possessed no expertise in historical enquiry, which I considered a necessary qualification for a formal work on a country’s toponymy. Also it soon became obvious that the time-frame for the project was likely to be long and undefined, which were not ideal conditions for the goal of producing a book. I therefore turned to the idea of producing a website, which allowed continual addition and update of information. Hence the birth, in October 2010, of Ghana Place Names. The purpose of the project is, as stated on the website homepage, “to find the meanings and origins of as many place names in Ghana as possible”. This statement requires a little unpacking. The distinction between ‘meaning’ and ‘origin’ will be familiar to most people interested in toponymy. The meaning of a name is purely etymological. It is a question of translating the elements of the name into common English, expanding where necessary to undo contraction and corruption, to obtain something which makes sense. Thus ‘Oxford’ just means a ford where oxen were driven across the river (Thames). But the origin of a name requires more information about how and why the name was chosen. I may not know where on the Thames the original ox-ford was, and whether the oxen which were driven across it were to be taken to market or just to another field on the farm, and that is the sort of thing I would like to know for the origin of the name. In Ghana, the origin may take the form of an oral tradition, which may be anywhere on a reliability spectrum ranging from accepted history through legend & myth to mere folk-etymology. An amusing example of the latter is provided by one author who would have us believe that the name of the town of Lawra in north-west Ghana is actually an English acronym standing for ‘Let All Warriors Run Away’. The derestriction of the number of place names to ‘as many as possible’ arises for two main reasons. Before setting up the website I started, in about January 2010 to collect information. It became obvious that I needed a database, and I therefore constructed my own using Microsoft Access. The simplest way to start was to have a table of place names, so I chose to use all the names that appeared on an ancient Shell road map which I acquired while in Ghana, based on the Survey of Ghana 1:500,000 of 1962. This gave about 3000 names. However I did not want to set a limit to the number of names in the project, because that would create a problem if a particularly interesting name came to light which was not on the map. So I also use a list of about 20,000 names supplied by the National Geospatial-Intelligence Agency GEOnet Names Server (GNS) as a supplement. Even then it is sometimes necessary to resort to other sources of information to locate some villages which come to my notice. 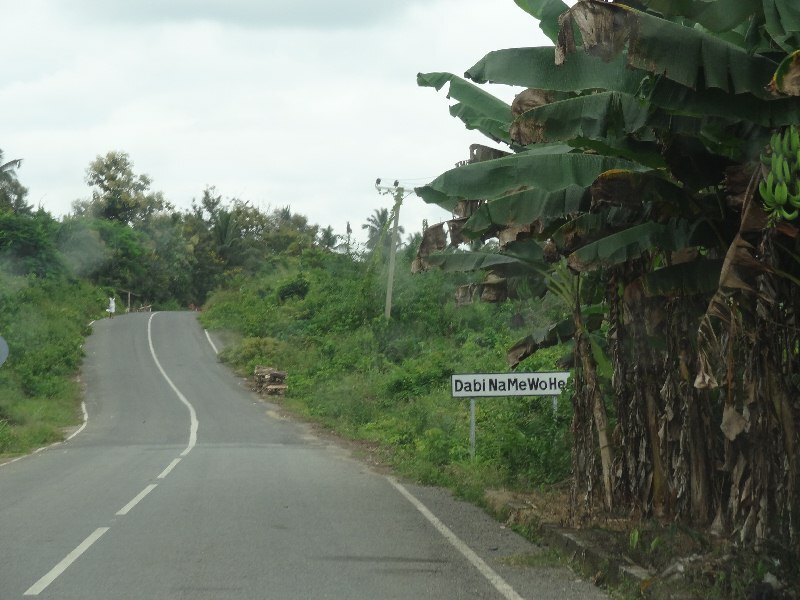 A delightful example of one such village is DabiNaMeWoHen, whose district administration has thoughtfully chosen to print the name on the road sign exactly as it appears here, thus guiding the toponymist to the meaning, which is ‘One day, where will I be?’ (implying ‘I won’t live for ever’). The second aspect of the scope of the project concerns the question of local language. I did not want to take the much simpler course of limiting the project to a single source language, which would in effect exclude certain ethnic groups and large geographical areas in the country. There are about 80 spoken languages in Ghana, and in some cases these languages consist of a number of distinct dialects or variants. This means that the interpretation of many of the names can only come from local speakers. Information is obtained in a variety of ways, but the internet is the essential key in most cases. Initially I found information on websites and online documents from various sources, such as volunteer blogs, aid agency reports, and travel, hotel, and holiday resort advertisements. In these cases, the authors had simply included toponymic comments from local sources, as an example of, or perhaps a contribution to, local culture. But as time went on, searches led to more academic works or papers which could then be borrowed through the local library, which has proved to be a service of great value, obtaining rare texts from university libraries as far afield as the USA and Ghana itself. There is a limit to how much can be discovered from the internet and existing records. Ideally field work should be undertaken to obtain information from local people. But this would not be practicable for one person even if living in Ghana. Towards the end of the first year of the project as the website was developing I attempted to involve Ghanaians. I wrote to over a hundred senior secondary schools, believing that teachers and students would be well-placed to obtain oral traditions from their home towns and villages. Almost all the SS schools are boarding institutions, some with very large catchment areas, so even students in a single school could represent a large number of such places. Approximately a 10% response was obtained, but unfortunately no results have been forthcoming from those who expressed interest. Knowing the conditions in Ghana, I think that the most likely reason for this is that the business of day-to-day life and work is so time-consuming that it is often unrealistic for local people to consider devoting time to what for them would appear to be a low-priority occupation. For those involved in education the stakes are so high that what to us might seem a worthy extra-curricular activity might instead represent a risky distraction from the main task. There is also the difficulty of getting financial support for such enquiries, because enquiries may require travelling, and travelling incurs expense. Furthermore, if there is any prospect of having to meet traditional rulers or elders to obtain information, Ghanaians would be only too well aware that such an approach cannot be made without making appropriate gifts and following traditional protocols. Hopefully, in the not-too-distant future this situation may change, as Ghana moves towards middle-income status and computers become commonplace in schools and internet cafés. Toponymy is not high on the list of academic or leisure pursuits, even in more developed countries. But attempting a country-wide toponymy with the participation of indigenous people at grass-roots level could well be unique on the continent of Africa, not to mention elsewhere. This could provide some incentive, together with the prospect of documenting important aspects of culture and history otherwise not recorded, nor in some cases even discoverable. At the time of writing the online database has over 1400 toponym records, while the offline database has a further 600 with unresolved queries, such as questionable translations which cannot yet be verified. There are about 1400 of the original 1962 map corpus which have as yet no data. Whilst this may sound impressive, it should be borne in mind that inevitably it is in the most remote places, largely in the north of the country, where many toponyms remain unsolved. These derive from little-known languages, sometimes not even the same as those now spoken in the area. It is there that local informants are greatly needed. The task is therefore far from ‘finished’, if that term could even be given meaning in this context. For those who are technically inclined, a few explanations about the online database may be of interest. The offline (MS Access) database, which I use for my research, uses the standard tools of relational databases. A single form with a pull-down list-box brings up any place name in the database, together with its locational and administrative data, any toponymic data so far obtained, and source references. I wanted to mirror these records online for all those which have a minimum of relevant data, namely map location, and meaning. As I had chosen the user-friendly but technically-limited Google Sites to create the website it was not possible to have a database server online which would reproduce the methods used offline. I therefore opted to use a Wikipedia-style database with each toponym record having its own web-page, but using a common template. If each page were copied across manually it would be extremely laborious to keep up with progress. I therefore used the HTML source for the online template as a basis for an Access ‘report’ which can be generated from any toponym record offline. This means that the Access database can generate at the click of a button the HTML code needed for the online page. The only labour required is therefore that needed to name a new page on the website with its standard template, into which is pasted the HTML code from the Access report. To anyone who takes the trouble to browse the website, it will be obvious that Ghana place names are wonderfully varied and descriptive. There are simple locational names like Praso (On the River Pra), environmental names like Odumase (Under the Iroko Tree), and commemorative names like Kofi Pari (an early twentieth-century cocoa farming pioneer). Then there are names which tell of hardship and migration, such as Mempeasem (I don’t like trouble), Ohiayeanisa (Poverty is harassment), Asempaneye (This is good news), and Paga (My eye is fixed on this land). They are indeed a window on the minds and hearts of the people, which is why my favourite has to be Domeabra: If you love me, come. British readers may wonder why the project name is not ‘Ghanaian Place Names’ or ‘Place Names of Ghana’. The reason is that it is common in Ghana for the name of the country to be used adjectivally in this way. Ghana Place Names: https://sites.google.com/site/ghanaplacenames/. It is easier in practice to use the project name as a web search than to copy the URL.